After being pleasantly surprised by how much I enjoyed The Changeover, I decided to read a few other books friends had been enthusiastic about that I was sort of on the fence about reading. This book is just really unique. I don't think I've ever read anything quite like it, although at the same time it did make me think of other books (like the sense of urgency felt like The Hunger Games to me and the island setting made me pick up my next read which I'll talk about soon, plus the father preferring Sean over Mutt reminded me of The Ask and the Answer..well you get the idea). The world is so well realized and combines all these things I just really like about the connection of people to place, and also survival. It's one of the most atmospheric books I've read in a long time. And I was just so lucky because we don't often get rain here, but this year it rained and was cold off and on throughout the holiday week so I was able to sit out in my car (I'm weird, okay) where I could hear the rain pattering on the roof of my car and read this glorious book about people on an island where when it storms the killer horses come up from the sea and they might die. Okay so basically this book is about the island of Thisby and how they have this problem that they also love--the capaill usice which are water horses. This is an actual myth I never heard of (no surprise there) about horses that rise from the water around November and eat flesh. 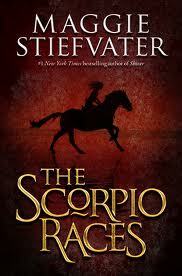 But Maggie Stiefvater doesn't hold true to all the lore, she took what she wanted and wrote this book. Anyway on Thisby, these horses come up and they are wild and dangerous. And it's kind of funny because it fits in well with the werewolves tales as these characters feel half wild themselves and there's always this pervading sense throughout the book that civilization has a very weak hold on their lives. Like the capaill usice, they could go wild at any second. Anyway, every November they hold the Scorpio Races where everyone gets on the back of one of these flesh eating horses and races. People die and some people win big amounts of money. And Puck, our heroine, decides to enter when her older brother says he's leaving the island. Puck doesn't get why he's leaving...she loves Thisby and their life there, but Gabe, her older brother doesn't actually like the threat of being eaten by horses. She really doesn't know what she's getting into, but she has the courage to want a different life and to succeed and she makes friends with Sean who is awesome, and he helps her and an awesome story awaits. And it is really gripping, like I didn't want to put it down. And I loved the characters, I loved Sean and his relationship with his horse, and the ideas about happiness and getting what you need and courage and freedom. I loved the sense of urgency and all or nothing that pressed onto every page and interaction. I loved the strong family relationships, I loved that the tense scenes were actually that. Really, I don't know why I didn't read this a long time ago, it is so good. And now I need to read The Raven Boys!